If you are unable to view this video, click here to watch on our YouTube channel. We’re big fans of the maxim: “drive to conditions.” Highway travellers improve their safety dramatically by following those three words, especially in winter. Our highway engineers set speed limits based on IDEAL driving conditions – think bare, dry roads and warm, clear weather. Once factors mess with these conditions – be it fog, rain, snow… whatever – drivers should adjust by slowing to a sensible speed. Now, you may have noticed crews installing new signs on sections of the Coquihalla, the Trans-Canada, and the Sea to Sky Highway. These are digital variable speed signs, part of a pilot project to reduce weather-related crashes by helping drivers know when to slow down, depending on current conditions. There will be a system of traffic, pavement and visibility sensors set up to detect conditions and provide operations staff with recommended speeds. 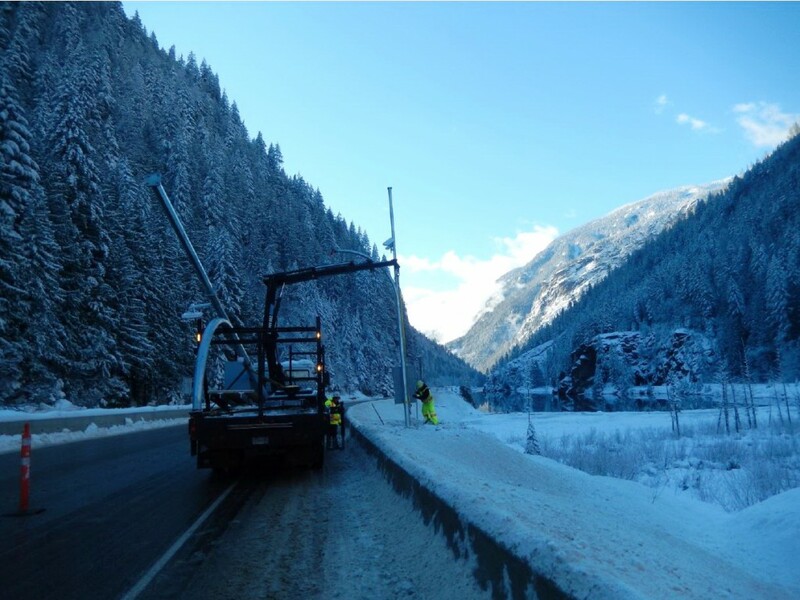 BC’s weather changes quickly, especially in high elevation mountain passes; operations staff will continuously monitor the conditions information and adjust the digital variable speed signs accordingly. Overhead message signs will let travellers know when they’re entering a variable speed zone, and warn drivers to be aware of changing weather conditions. Variable speed limits will be enforceable by police. Installing variable speed limit sign on Highway 1 in November, 2015. We need the system’s accuracy to be spot-on before travellers can see the digital signs. Once everything is installed (poles, signs, optical sensors), we will spend two to three months testing and refining with the signs covered. We anticipate the system will be ready to go live by early 2016. The variable speed limit pilot project is part of the Road Safety Improvement Program included in BC on the Move, the ministry’s 10-year Transportation Plan. What do you think about the variable message sign pilot project? Do you think it will help you Shift Into Winter? Let us know in the comments section below. I want to express my concern on the Sea to Sky Hwy between Squamish and Whistler. I make this drive weekly and more often than not the posted speed limit on the sign is not inline with conditions. I have left Squamish in the rain with the posted speed limit of 80Kph (which is respectable) only to find further towards Whistler where the rain has now turned to snow and road conditions are deteriorating to see the posted speed limit at 100kph. This IS dangerous! I grew up back east driving in snow and ice and know how to drive to conditions so I do not rely on the variable speed signs. However, many people who travel this stretch of highway are visitors and may have never driven in snow and icy conditions and ARE reliant on these signs. I would like to see the severe weather warning lights just past Alice Lake used more like they were in the past to warn people of the conditions. So far the variable speed signs have been poorly executed. I hope better monitoring will be in place to adjust the speed according to the weather, otherwise there was no point to have put these signs in place. Thank you for sharing your concern with us. I relayed your comments to our engineering department. As you know, the aim of the Variable Speed Limit System is to provide drivers with better information on the road conditions ahead. This system depends on data collected from road sensors as well as the operating speed of drivers. Signs are generally spaced at two to seven-kilometre intervals, based on site conditions, with sensors located at a similar spacing. The system aims to post speed limits according to the road conditions and drivers’ reactions. However, there are limitations to the system as the sensors are only positioned at certain locations over the entire system. Posted speed limits can only be calculated based on the data that was gathered. As always, posted speed limits should be considered “ideal” rather than representing the extreme worst condition, in part due to the infrequency of data collection. As such, drivers must always exercise judgement and caution to these surface and atmospheric conditions in their vicinity. We will continue to monitor the system by analyzing data with the purpose of improving the system. I drive between Revelstoke and Salmon Arm twice weekly. Variable speed signs have seemed to make things more dangerous – not less. The problem is that the signs are by necessity poorly updated, and as a result many people feel enabled or obligated to drive faster than conditions allow. If the signs are updated remotely, cameras don’t pick up black ice. If they are updated manually, someone has to drive back and forth constantly. Neither situation would work all the time. These signs are rarely updated to properly reflect conditions, and this winter I have seen 100kph signs hanging over terrible black ice where traction in corners failed around 60kph (I observed this most recently both on Dec 27th, and Dec 29th 2017). In adverse conditions, everyone knows they have to slow down, but a variable sign suggests that people stop using their own judgement. It is delegating common sense, and it’s a terrible idea because the technology does not exist to keep these signs up to date properly. We all need to be responsible for driving to conditions. Bringing road maintenance levels back to where they were 20 years ago would help. Driver training in high school and a public information campain regarding speed and tailgating would help. The only people these sings help are the people who sell and install them. Hello Dan and thank you for your comment. We’re big fans of the maxim: “drive to conditions.” Highway travellers improve their safety dramatically by following those three words, especially in winter. We do everything we can to educate the public that driving to conditions and maintaining a safe distance are in their best interest, especially in winter. Our Variable Speed Limit system uses traffic, pavement and visibility sensors set up to detect conditions, feed our sophisticated software with data and provide operations staff with recommended speeds. This happens several times a minute for some of the devices. 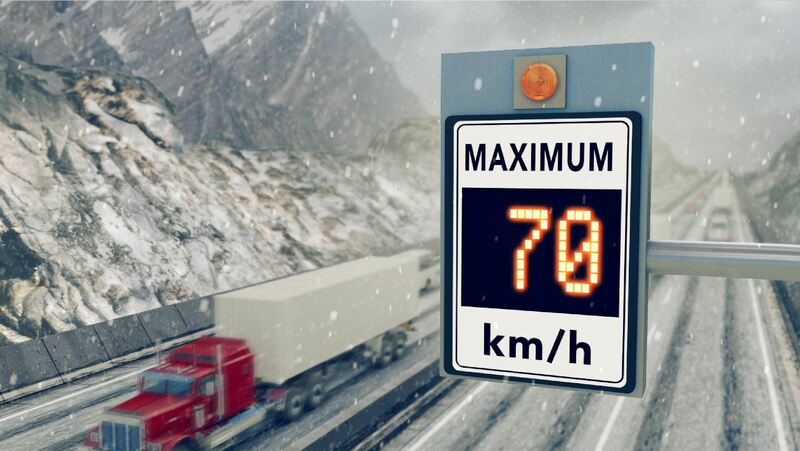 When a change in conditions is detected, the software grabs the attention of the operator and suggests the new speed limit based on the real time road conditions. The operator at the RTMC would respond to this change verify it and approve it within several minutes, sometimes within seconds. The software is monitored 24/7 and the speed limits are always up to date. Hope that this helps. Drove back from Whistler on Sea to Sky highway on January 7. Left Whistler at approximately 6:00 pm. Both the driver of the car and I have driven round trips on this highway at least 20 times during the winter since the mid 80’s so we know the highway and the changes very well. We are both very experienced winter drivers. When we saw the sign at Function Junction suggesting speed of 80kmh we were flabbergasted. The snow on the highway was very wet and very heavy. It was heavy enough that if you drove out of the tracked down section of road it would be difficult driving with an AWD and you did not have a AWD vehicle it would be dangerous. The conditions got worse as we went south. When we saw the 100kmh posted in the Cheakamus Canyon we were even more flabbergasted. The conditions were bad enough that a large truck would probably need chains. the variable speed signs throughout the trip until we got to Squamish were posting speeds that were at least 20 kmk and probably 40kmh too high. You need to evaluate your equations to accommodate air above the highway which is quite a bit colder than the highway itself…. Thanks for connecting with us here and sharing your concern. We have sent your comment forward to the area manager for review. In the case of a conflict between the variable and fixed speed limit signs, which prevails? All signs and sensors have backup power, but should a power outage occur, or a speed sign is blank, drivers are to maintain the speed of the last posted speed sign. Just checked Drive BC before heading to the coquihalla but the variable speed limit sign section is gone? We have been experiencing some technical difficulties with the Variable Speed Limit layer on DriveBC. We are working on it and hope to have it back up and running as soon as possible. Thanks for your patience! Great initiative! Curious to know.. what is the cost of implementation? I’m a transportation planner looking for programs or projects that can address key issues. We have a problematic section of the highway at the cut between west van and north van and the bottom of the cut near Second Narrows bridge.. can these signs be implemented as a stand alone? What kind of staffing/time is required for implementation? Sems these accidents only happen during poor weather. Could help make people more aware of what appropriate speeds are during heavy rainfall. Thanks! We have sent your comment forward to our Traffic Engineering unit for review. Stay tuned! We have lots of information to share with you about the costs associated with this program. Please connect directly with the program manager, Jennifer Locke at 1 (604) 527-2299. Thanks! This very expensive outlay for a very limited system will be of no avail unless there is a huge increase in enforcement. We desperately need the return of electronic speed monitoring – proven to reduce crashes. Is every driver who goes off the road on the Coquihalla in winter ticketed for driving too fast for conditions? Surely, sliding off the road is proof of excessive speed. Finally, you must stop listening to S.E.N.S.E. If any advocacy group can be said to have blood on their hands, it must be them. Never, ever anoint them as “stakeholders” again in any of your deliberations; it’s totally ridiculous, as are they. Thanks for connecting with us here and sharing your concern. The purpose of the Variable Speed Limit System is to determine the appropriate speed limit when conditions deteriorate due to unpredictable weather events. Hwy 5, Snowshed Hill experiences 78% of its serious collisions in the winter months. The BC RCMP are supportive of these systems. Hope that this helps. Hi, I think this idea is brilliant. Most people don’t drive to road conditions and think they are on the Auto-Bond. It is a fact that speed kills. I just want to get to my destination safely. I worry about the other fellow. Is he a cautious driver? Does he know my life as well as his is in his hands? Probably not. Since drivers don’t use common sense and slow down during unsafe driving conditions, I am super happy that speed limits are reset and this makes drivers accountable for their actions. I do agree with Ronda that we need these signs on the Island. Highway 19 and the Malahat can be a nightmare to drive with the weather conditions changing at any minute, especially in the fall and winter. Thank you for keeping us safer on the roads and highways. Keep up your brilliant work. Thanks for connecting with us here and for your positive feedback. We will be sure to send your suggestion for variable speed limit signage on Vancouver Island. How can we please please get one of these for Highway 19 on the island … before anymore deaths happen!! For some reason the island has the worst unique driving conditions in the winter with hydroplaning, black ice – the rain comes down so hard you can’t see 10 ft in front of you, fog so dense you can’t see the edges of the rd – the wind gusts through the cook creek area sometimes get up to over 100km an hr – sure 120 km is fine to go in the summer – ? ?but seriously if you’ve never driven this highway before -However no matter how good of a driver you are – it only takes a split second to loose control under these conditions – could possibly be put in on high crash sites.. Im begging – how much does one of these variable speed signs cost ??? Thanks for connecting with us and sharing your concerns. The signs that we have installed are part of a pilot project but if the project proves successful, we will be looking for other locations to install the signs in. I have shared your feedback with the project manager for review. Interesting concept. Now, are those signs will be added in the z-series of signs and when does Trans BC will publish a new updated version of the MUTCD? The most recent version available on your site date of 2000…A lot of signs have changed since. A new version for 2016 would be great. The ministry is developing the policy and documentation outlining the Variable Speed Limit System, including the signs installed on the road; however, the ministry does not publish the MUTCD for Canada. That document is published by the Transportation Research Board and we use it, as well as many others, as reference in developing our own policies and standards. When information in this manual becomes dated and requires updating, we typically release a Technical Circular addressing the improvement in the standards. Here is a link to our technical circulars: http://www2.gov.bc.ca/gov/content/transportation/transportation-infrastructure/engineering-standards-guidelines/technical-circulars. Just another morning with a snowstorm and drivers not driving to conditions. Two sets of flaggers out between Perry River and Revelstoke flagging MVIs. Just winter as usual out here. Perhaps your analysts felt they needed accident data from two winters with a 100 km/h limit to compare with the variable speed limits and the previous 90 km/h limit? When can we expect the Ministry to publicize the results of this trial and are you going to analyze and publicize the results of the recent increase in speed limits? Thanks again for connecting with us here. We have asked the project manager when the data/results from this trial will be made public, so stay tuned for that. We expect the results from the speed limit increase to be released by the end of December or possibly early January. We spoke with the project manager responsible for the variable speed limit sign pilot project and she confirmed that a status report on the effectiveness of the project will be shared out after the project has been up and running for approximately a year. Two to three months testing – i.e. December, January, Feburary. Oh well, maybe they will reduce accidents NEXT year. Waste of money. No one pays any attention to speed signs and most people drive like idiots in the rain and in winter conditions. There are 75000 auto accidents a year in BC witch proves my point. Speeding is quite low on the priority list because not enough people are killed or injured to worry about it. The police show the colors when their is nothing better to do. The S. G.’s office are not serious about making and enforcing laws that will reduce accidents.They are afraid of their jobs, don’t want to offend the bad guy’s, cost the gov’t votes or it’s not their job and the computer says that they can’t do any thing about it. The whole bunch are are a waste of time and money just like your signs! Signed FED UP! We are sorry to hear you are frustrated. Thanks for sharing your concerns. We will make sure your comments are passed on to the project manager for this test project. Sadly it’s come to this, variable speed limit signs. 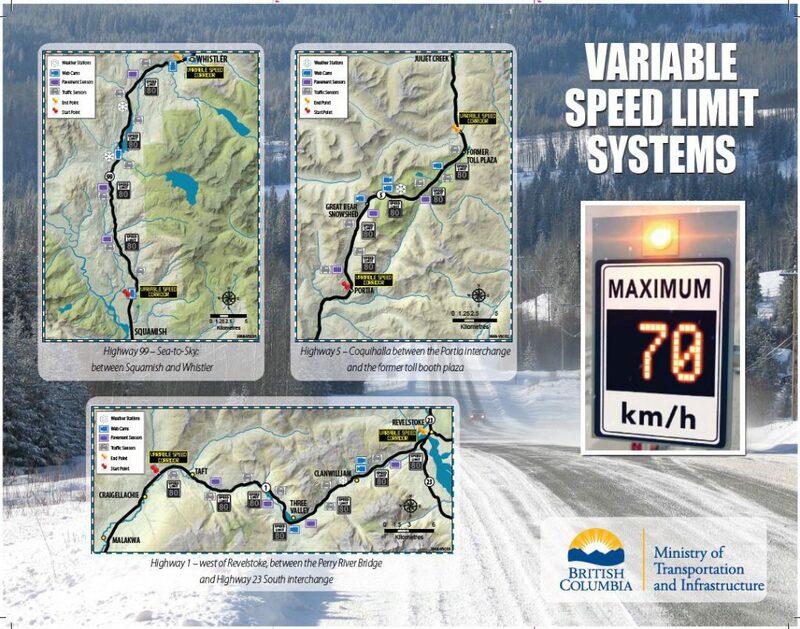 Who knows how many times I’ve been on the Coquihalla in the winter driving to conditions…sometimes slowing to as slow as 35Kph tops in heavy heavy HEAVY snow conditions only to get passed by people thinking they can still do triple digit speeds. All too often the usual happens I come across these often braindead people slid off the road. People need to learn that even though the speed limit may be oh let’s say 120Kph, you certainly don’t want to be doing anywhere close to that in seriously heavy snow. It’s about time… I have no idea why this took so long to implement. I hope this helps people drive safe. Thanks for your feedback Ed. We are hopeful that this trial will prove a helpful tool in addition to plowing and sanding.